Abu Dhabi General Services Company Musanada has started work on two school projects - the Mohamed bin Zayed School in Abu Dhabi and the Jebel Hafeet School in Al Ain. 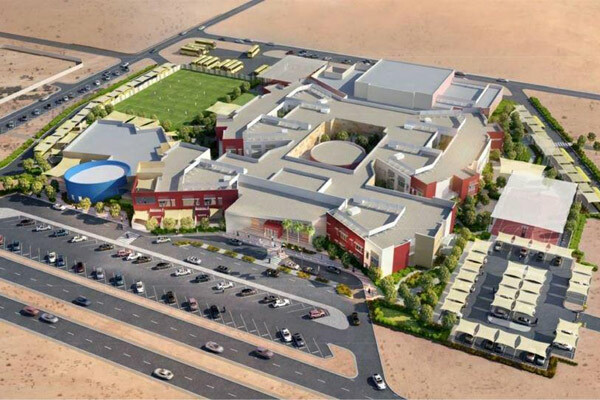 The schools, which are being built at an investment of Dh288 million ($78.3 million), will come up over a 117,000-sq-m area and accommodate a total of 4,040 male and female students in 147 classrooms. "The execution of these two projects forms part of Musanada’s efforts to realise the vision of President HH Sheikh Khalifa bin Zayed Al Nahyan and implement the directives of Sheikh Mohamed bin Zayed Al Nahyan, Crown Prince of Abu Dhabi and Deputy Supreme Commander of the UAE Armed Forces, towards delivering projects that provide facilities aligned to the emirate’s advanced educational level and providing a stimulating educational environment to both students and teachers," remarked Saleh Al Ali, Musanada’s education portfolio director. Unveiling the details, Al Ali said that the Dh170-million C2 and C3 Mohamed bin Zayed School for boys forms part of Abu Dhabi Future Schools Programme (ADFSP), Phase Seven, Package One, and that Musanada plans to handover the school to Abu Dhabi Department of Education and Knowledge (ADEK) in December 2019. "The school will be constructed on an overall area of more than 25,900 sq m within the total area amounting to 78,912 sq m allocated to the project," said Al Ali. Set to be completed within 16 months as per the agreed delivery schedule, the Mohamed bin Zayed School will comprise three floors (a ground floor plus two storeys), and will accommodate 2,550 students (1,500 C2 students and 1,050 C3 students), and will include 85 classrooms (50 for C2 and 35 for C3). It will also include a library, science, arts and computer labs, a multipurpose hall, administration offices, an equipped sports hall, a cafeteria, a dining hall, a prayer room for students and the administration, external playgrounds, parking spaces and external landscaping," he explained. As for the Jebel Hafeet School, Al Ali said that this school also forms part of ADFSP, Phase Seven, Package Two. The Dh118-million C1 and KG school will be constructed on a plot at the northern part of Jebel Hafeet area in Al Ain city on an overall area of 38,422 sq m, including 12,505 sq m dedicated for the buildings. "The school will comprise two floors (a ground floor plus one floor), and will accommodate 1,490 male and female students (1,250 C1 students and 240 KG students), and will include 62 classrooms, including 12 for KG. The school will also include two classrooms for arts and music, a library, administration offices, a multipurpose hall, a cafeteria, a dining hall, external playgrounds, parking spaces and external landscaping. The total built-up area of the facility (ground floor plus first floor) will be 17,596 sq m," said Al Ali. According to him, these projects will boast latest electromechanical systems, including air-conditioning and fire-fighting systems, in line with Adek’s Design Manual and requirements, and in accordance with the regulations and requirements of the concerned authorities.